Home / back pain / What Are the Symptoms Of a Herniated Disc? A herniated disc is among the more common spinal conditions. As we’ve discussed in previous blogs, a spinal disc becomes herniated when the outside wall weakens, allowing the material in the core of the disc to push outward. But what are the symptoms of a herniated disc? The answer depends on where in the spine the herniated disc is located, and the extent of the herniation. If the herniated disc isn’t pressing on a nerve, the herniation may be asymptomatic, causing no pain or restrictions to mobility, or simply manifest as an ache in the area of the compromised disc. However, if the herniation impinges on a nerve, it may result in pain, numbness, or a tingling sensation and/or weakness in the area of the compromised disc, or in any part of the body controlled by the impinged nerve. If in the lower back, the most common site for herniated discs, it may cause sciatica. Sciatica describes the numbness and/or tingling in the buttocks and down a leg involving the ankle or foot, as well as low back pain, associated with impingement of the sciatic nerve, which runs from the base of the spine to the foot. 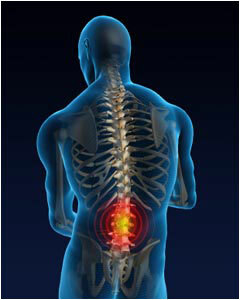 Onset of symptoms of a herniated disc may be gradual or sudden, and the pain constant or intermittent, complicating diagnosis. The pain may be exacerbated by sneezing or coughing. Depending on the individual, bending or twisting motions, prolonged standing, or conversely sitting, may also exacerbate the condition. Any position that relieves pressure on the nerve – walking or lying down, for example – may ameliorate the symptoms of a herniated disc. One signature of herniated discs in the lower spine: they typically affect only one leg. If the herniated disc is positioned near the top of the lower region of the spine, the impinged nerve will control higher areas higher in the legs, and the pain may be felt in the front of a thigh, for example. In the thoracic, or mid-portion of the spine, herniated discs often cause no symptoms or pain at all. When symptoms do occur, the pain is usually felt in the upper back or chest area. Herniations that occur in the neck, or cervical region of the spine, manifest their symptoms in the shoulders, arms or chest. Ultimately, a diagnosis of herniated disc is based on radiographic imagery along with a thorough medical examination and detailed medical history. Fortunately, once the diagnosis is made definitively, a variety of therapies are available to ameliorate the symptoms of a herniated disc.